CANNES, France — Carlos (Cacá) Diegues presented his latest directorial feature at a Special Screening in Cannes. 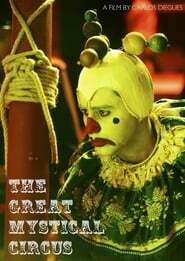 A celebration of magic, entertainment and cinema,”The Great Mystical Circus” is inspired by a poem from Brazilian poet Jorge de Lima. It follows a family Outlawed of circus entertainers through five generations, told in a series of intertwining tales, all set to a soundtrack by Chico Buarque, who originally adapted the poem for the stage in the 1980s. Starring Vincent Cassel, Jesuíta Barbosa, Bruna Linzmeyer and Mariana Ximenes, the film is produced by Brazil’s Luz Magica Produçoes and Globo Filmes, Portugal’s Cover Versions Fado Filmes and France’s Milonga Productions. Spain’s Latido Films is selling international sales rights.